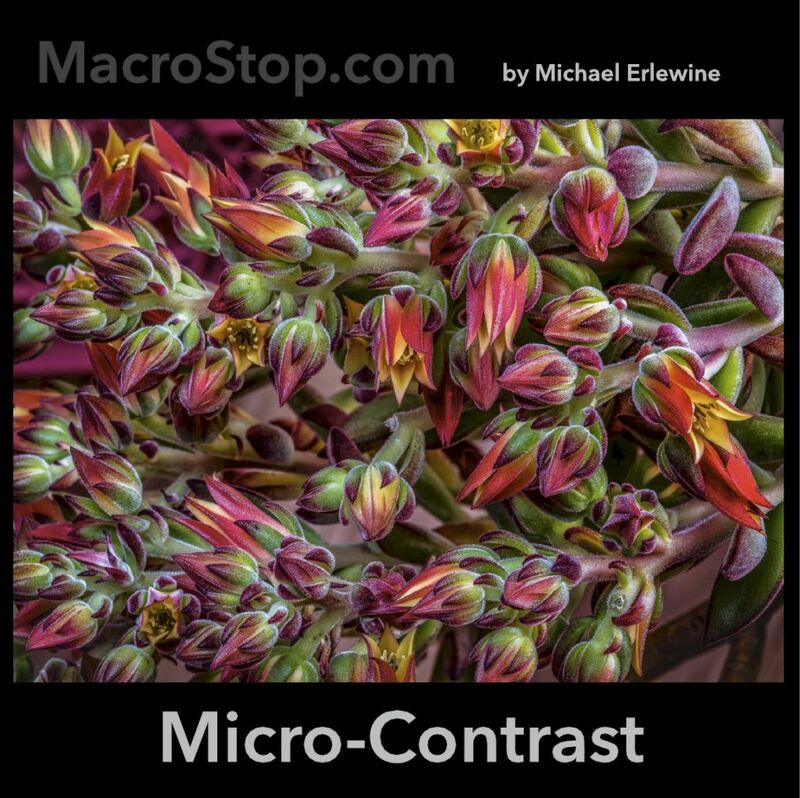 “Micro-contrast” is a very popular term considering it has no formal definition that I can find. Some even claim it doesn’t exist. Nevertheless it has become increasingly important in my photography work. Perhaps I can’t define it, but I know it when I see it. What follows are some thoughts I have been having about local satisfaction -- micro-contrast. It seems that everything these days is going local, locally grown foods, and so on. And this even extends to photography and what has been called local contrast, more frequently termed micro-contrast. Perhaps the issue of micro-contrast is popular now in photography because more and more makers of cameras are removing their low-pass (AA or blur) filters, exposing more detail to the sensor. Unlike analog imagery (like film), digital imagery finally reduces a photo to a large series of small pixels that, if looked at closely enough, don't line up together smoothly, especially with straight lines. Instead, we get a jagged line on very close inspection, an effect that is termed "aliasing." We have all seen aliasing on our computer screens when we over-expand any bit-map graphic. To counter “aliasing” camera makers introduce what is called a low-pass or anti-aliasing filter over the sensor that effectively gently blurs the jagged edges between pixels, making them appear smoother to our eyes. However, at the same time that low-pass filters improve the lines, they also very faintly blur the entire photo. Not everyone is sensitive to this. And micro-contrast is not the same as sharpness, although they are related. Contrast at the pixel level, such as increasing contrast around the pixel edges, is called sharpness, while contrast that is greater than the pixel level, but less than the overall picture, is called local or micro-contrast. Sharpness is how well resolved the boundaries between color areas are. Micro-contrast is being able to differentiate between areas that are very slightly different in color and luminosity -- enhancement. Micro-contrast has come more into its own in recent years with the advent of larger camera sensors (and larger pixels) because it allows better contrast differentiation between individual pixels. As mentioned, low-pass (anti-aliasing) filters blur out information that the limit of the sensor cannot resolve, whatever goes past the so-called Nyquist limit. Micro-contrast resolves clarity in all the details, while not detracting from the overall image. It has been likened to an audio recording, where although you are listening to the entire symphony, you can still isolate and here the whisper of a wind instrument in the background of the mix. Larger camera sensors (36 MP and above) make for better micro-contrast, and wider lens apertures enhance this effect until flaws in the lens optics themselves begin to degrade the image. In general, large sensors, wide apertures, and highly-corrected (APO) lenses make for better micro-contrast in my experience. Medium Format cameras (Hasselblad, Mamiya, Linhof, Rollei, and so on) used in advertising and landscape photography typically don’t have low-pass filters because their larger format makes low-pass filters less necessary. As DSLRs sensors get larger and larger, the need for AA filters is becoming less, and camera makers are going naked, removing the low-pass filters with the result that the resulting images are sharper and local contrast (micro-contrast) is enhanced. As mentioned, where low-pass filters on cameras kind of blur out the ultra-fine detail, these new cameras like the Nikon D800E and the Sony A7r (and others) are letting the sensor resolve detail to the limit of the sensor, and the result are sharper images and a renewed interest in micro-contrast. In a way, micro-contrast is the reverse of "bokeh" (a Japanese word for the beautiful blurring of an image), usually whatever makes up the background. So while bokeh is a general softening or blurring of an image, micro-contrast is just the reverse, an apparent sharpening or crisping of an image so that it sharpens and better captivates or satisfies the eye. Micro-contrast is vaguely analogous to some of the fractal imagery, where infinitely tiny areas of the image are granular and self-similar or reflect the larger patterns of the whole scene, with the effect that there apparently is no end to detail. In other words, rather than be uninteresting and without detail, micro-contrast encourages the eye not to roam farther, but to find contentment in each part of the photo, wherever it roams. To me, micro-contrast is local satisfaction for the eye and the mind. In my opinion, what is called micro-contrast depends on sensor resolution (usually the more pixels the better), acutance (subjective perception of sharpness based on edge contrast), and highly-corrected (APO) lenses. I include a number of photos taken with the various higher-end Nikon camera bodies using various apochromatic (APO) lenses. They may or many not meet your specifications for having “Micro-contrast,” by IMO they are headed that way. Here are photos that show micro-contrast IMO.